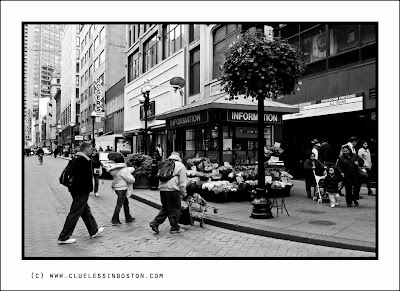 Downtown Crossing near the information booth. More black and white photos can be found and Aileni's home of the Monochrome Maniacs. very nice, I like the stark contrast you have captured here. Superb, black and white photos are so stylish! One more person crossing the rao and it would have been a Beetle album cover. Nothing beats a citiscape in black and white! Great energy. I like John's comment. Excellent choice for b&w. I love the way you invite the viewer to imagine the color of those flowers and the next step of the pedestrians. Love the black and white. Also love to figure out where you took the shot! Looks a bit chilly! Like a grey, winter day! Which was probably your intent, right? I like this picture a lot. :) The monochrone really brings out the stories of all the people in it. Very nice!